As any company, I like to write about interesting applications in which are load cells are used. But often customers can be quite wary of giving away too much information and I quite understand this. However, if the application is not sensitive, talking about it can be great publicityÂ for your company. We employ an experienced and professional PR team at In Press who will be able to put together the story on your behalf and get it published in the relevant media. So, if you would like to work with us to gain publicity for your company and the work that it does, then please contact me. Here is an example of joint publicity we completed with EDF Energy on a great project we did on the London Eye. EDF and their publicity department had final say on the copy and we had it published in a variety of different journals throughout the trade and technical sector. Since 2009, The EDF Energy London Eye, the UK’s number one paid-for visitor attraction, has been going through a Â£12.5 million upgrade that is set to further improve the visitor experience, increase environmental credentials and â€˜future proofâ€™ one of the UKâ€™s most iconic landmarks for years to come. The work will be completed in time for the 2012 London Olympics. This complex project, which involves removing each of the 32 10tonne capsules in turn, has over 20 companies working on design, planning, sub-projects and logistics. The owners of The EDF Energy London Eye, Merlin Entertainments Group were committed, wherever possible, to use UK businesses and this has been achieved thanks to the enormous amount of UK industrial expertise. Companies such as Isle of Wight-based LCM Systems have played a small, but crucial part in the process. The company is known throughout the world for designing and manufacturing a wide range of load cells for a variety of lifting and weighing applications. 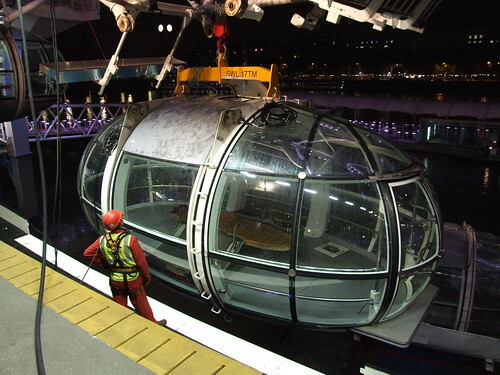 Its part in the upgrade programme involved providing a shackle load cell and TR150 hand-held indicator to ensure that when a 10tonne capsule was removed from the cantilevered observation wheel, it could be safely and securely lowered on to the pontoon that was waiting to transport the pod up the Thames. The capsules are attached to wheel via 4 pins that need to be extracted before the capsule can be removed. The process involved attaching the load cell onto an air hoist that was in turn attached to the capsule. Air was driven into the hoist until the load cell gave a reading of 10.5tonnes on the indicator, monitored on the ground by an experienced engineer. Once engineers were satisfied that the capsule was secure and could be lowered safely, the pins were extracted and the pod began its controlled descent. Without a safe and reliable load cell, the weight of the capsule would be unknown. 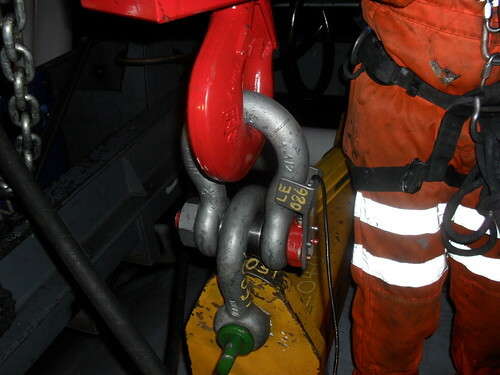 The SHK-B is one of an innovative range of shackle load cells designed specifically for lifting and weighing applications in harsh or rugged environments.Â LCM Systems can provide the cabled versions with Crosby shackles as standard or as an option with Greenpin shackles. Safety is paramount for the demanding applications in which these shackle load cells are used and the use of high-quality shackles is essential to comply with safety standards and regulations as well as to maintain integrity. All shackle pins are forged from high tensile carbon steel and proof loaded to 150% of the normal rated load. The products are sealed to IP66 to protect against harsh weather conditions. The TR150 handheld load indicator used in the project is a versatile and intuitive precision instrument. It is a portable, environmentally sealed unit that has been specifically designed for accuracy and versatility. With only six keys to access, the operator can easily set up the unit and the configuration menu enables the setting of a tare value, display resolution, filter rate, auto power off and selection of low power mode â€“ all through the front panel. This menu option also enables the user to tailor the instrumentâ€™s response to the application. The TR150 accepts an input range of up to 50mV/V and two separate ranges are available which means that the instrument can both read and display two separate parameters. In each range all the variables can be set, including zero and filtering. We are all very aware of todayâ€™s throw-away culture. In her recent book the Story of Stuff, published in May 2010 in the UK, Annie Leonard discusses how only 1% of products that we buy are in use 6 months later. You can see her talk about it in this excellent short animated discussion at The Story of Stuff. But itâ€™s not just the consumer culture that is to blame for this huge wastage. Many of us want to follow the latest fashions, be they in the consumer world or business to business sector. Because fashions come and go, products are often made without much regard to quality so they can be sold cheaply. And here lies another problem – cost. If something is only going to be used for a short space of time then whatâ€™s the point in spending a lot of money on it? But, and here is my point, what if the product is meant to last and its failure would have serious safety implications? The â€œpile â€˜em high, sell â€˜em cheapâ€ culture cannot be applied here, can it? Unfortunately it often is. I know negotiation on price is part of business but compromise shouldnâ€™t be. Take for example the LCM Systemsâ€™ shackle load cells for lifting and weighing applications in harsh, rugged industrial environments. Known throughout the world as manufactured to the highest possible specifications in high tensile carbon steel and using Crosby or Greenpin shackles, there is no doubt that they can do the job, day in, day out without any safety or quality issues. So why are people buying cheaper? LCM Systems is not the only company (unfortunately 😉 ), who sell such high quality products, so itâ€™s simply a matter of choice. It really is a case of Caveat emptor â€“ Buyer Beware. The cheap shackle load cells you are buying may claim to be equal, but is the safety of your personnel and the reputation of your company worth saving a few hundred dollars or pounds?